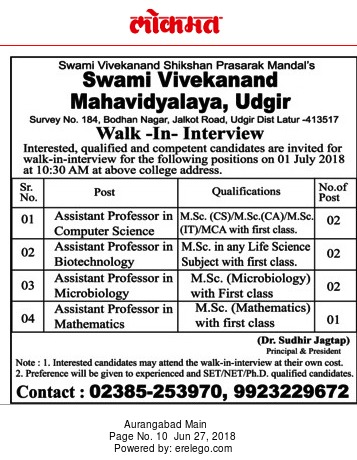 Swami Vivekanand Mahavidyalaya, Latur has advertised in the LOKMAT newspaper for recruitment of Teaching Faculty- Assistant Professor jobs vacancies. Interested and eligible job aspirants are requested to walk-in on 01st July 2018. Check out further more details below. About College : Swami Vivekanand Shikshan Prasarak Mandal, Ahmedpur has established Swami Vivekanand Mahavidyalaya at Udgir (M.S.) in June 2001. The college is permanently affiliated to Swami Ramanand Teerth Marathawada University, Nanded and included under section 2(F) and 12(B) of U.G.C. Act 1956. The college has established a research centre in Computer Science and Biotechnology which is the offspring of the college. This college is certified by an ISO 9001-2000 standard.